Rakhi - Raksha Bandhan 2017 Festival Information. Shravan purnima's second festival is Raksha Bandhan. This is an ancient tradition. Bhavishya Purana refers to a battle between gods and demons, and Indra (the king of the gods) was feeling depressed. At that time Indra's wife Sachi took a thread, charged it with sacred verses or Mantras for protection and tied it on Indra's hand. Through the strength of this thread Indra conquered his enemies. Since then till today this festival is celebrated. 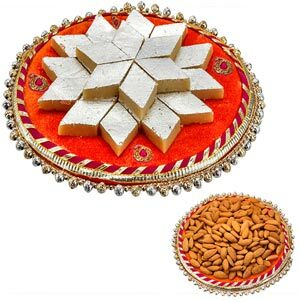 EEach person should celebrate with enthusiasm this sacred festival of Rakhi or Raksha Bandhan. (Raksha = protection. Bandhan = tie). 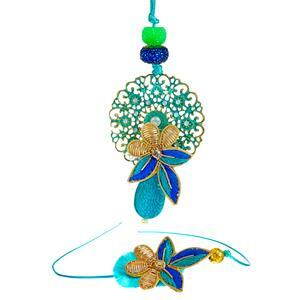 Celebrate Raksha Bandhan by sending Raksha Bandhan Gifts to your loved ones.